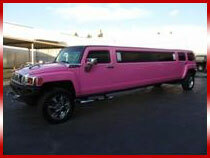 EXOTIC PINK HUMMER LIMO HIRE. 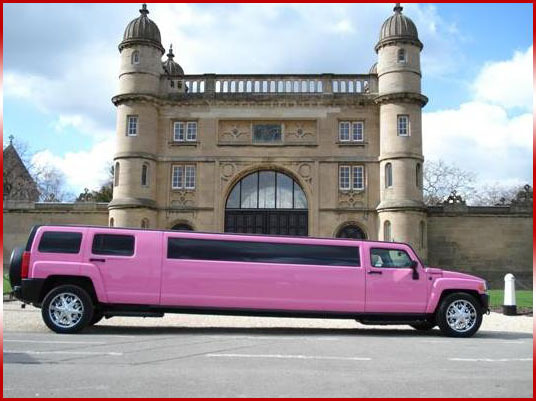 The pink Hummer limousine is one of our most popular limousines for hire and we are fortunate enough to have two in our fleet. 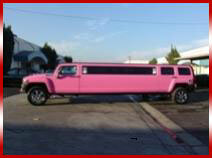 The pink Hummer makes the perfect limousine for birthday celebrations or hen parties. Finished in beautiful baby pink, this limousine is a guaranteed head turner. 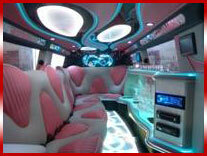 The pink Hummer comes kitted out with the usual high spec interior that you would expect from Midlands Limo Hire. The CD stereo has 12 speakers which has an output of 1200 watts and we are more than happy for you to bring your own music collection to test them out. If you fancy watching a movie then we have included a DVD player, which is connected to 4 flat screen TVs, so you can sit back and relax, whilst watching your favourite flick on the luxurious J-leather seating. Feel free to make use of our mini-bar, which comes complete with champagne flutes and ice buckets. The mini-bar will already be stocked with 6 bottles of complimentary bubbly or soft drinks to help get you in the party mood. Although the limo looks pretty in pink, this Humvee is a wolf in sheep's clothing. With a 6.5 , V8 engine, measuring 38 feet in length and sitting on 22” chrome alloys, this vehicle has enough torque to transport an army around, so underestimate this limo at your peril! When we arrive at a destination of your choosing to take your group to the party, you will be greeted by your very own chauffeur, who will make sure that you feel like a million bucks. The driver will help you enter and leave the limo and will open and close doors for you, making sure that you arrive at your celebration in style. If you want to know what it feels like to be treated like to be a celebrity, then let us show you. 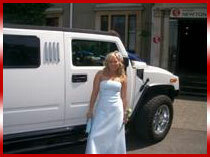 If you are considering limo hire to make your event that extra bit special, then let us show how limousine hire should be done. We can pick you up from a destination of your choosing and can arrange for a return pick up as well, making sure that you get home safely and in comfort. We provide a UK nationwide hire service and are available 7 days a week, 24 hours a day. 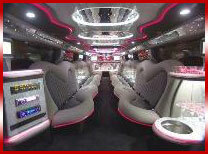 The Pink Hummer limo has all the latest features inside the are mind blowing, Disco floor awsome sound system, lazers, lighting, chrome alloys and pink matching interior. 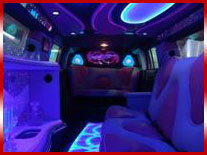 Midlands limos travels to leicester, Derby, Nottingham and Birmingham on nights out around the bars and clubs.